Who doesn’t love a good ol’ no-bake recipe? Especially when that recipe contains peanut butter AND chocolate! 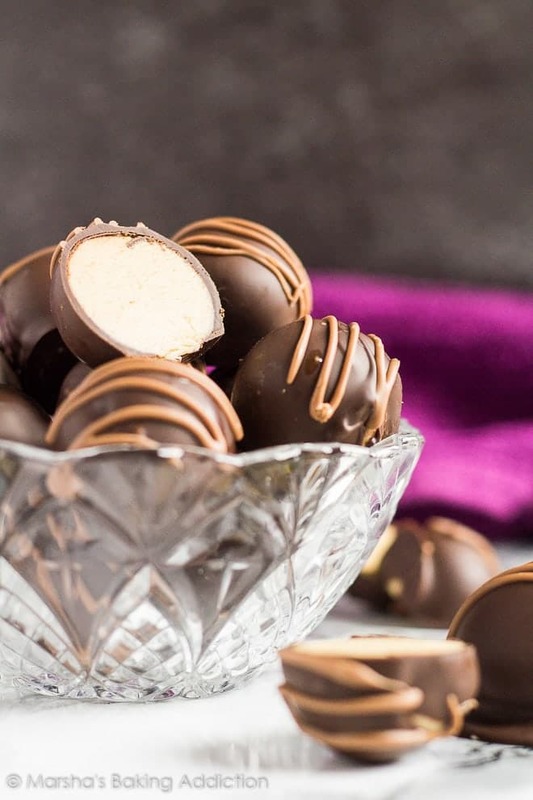 Today, I bring you one of my all-time favourite bite-sized treats – No-Bake Peanut Butter Truffles. 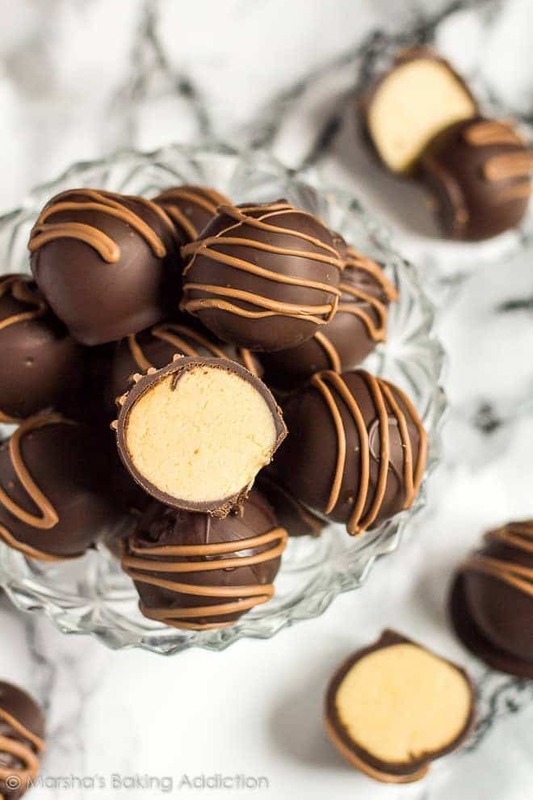 Creamy peanut butter balls coated in a dark chocolate shell, and drizzled with even more chocolate. Peanut butter and chocolate heaven! 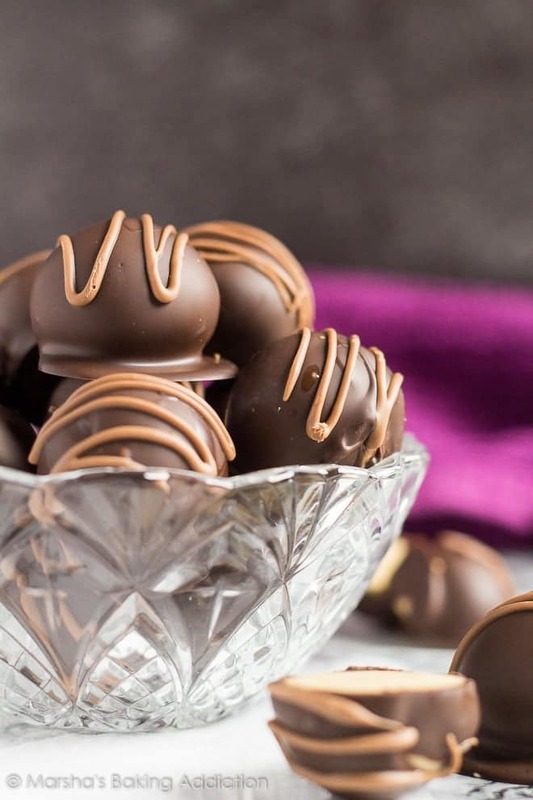 To make these truffles, beat the butter until light and creamy. Add the peanut butter, vanilla, and salt, and beat until smooth and combined. Add the icing sugar, and beat until combined. The mixture will be crumbly, but you should be able to roll into balls! Roll the dough mixture into 1-inch balls (about 0.5oz each), and place on a large baking tray lined with parchment paper. You should have about 40 – 45 balls. Refrigerate until firm – about 1 hour. For the chocolate coating, add the dark chocolate to a microwave-safe bowl, and heat in 30 second intervals, stirring after each one, until melted and smooth. Leave to cool for 5 minutes. Repeat with the milk chocolate. Dip each peanut butter ball into the melted dark chocolate, and place back onto the baking tray. Drizzle with the milk chocolate. Allow to set at room temperature or in the fridge before serving. perfect for chocolate and peanut butter lovers! How long will these truffles last? These truffles can be kept in an airtight container, layered between parchment or wax paper, in the fridge for up to 1 week. 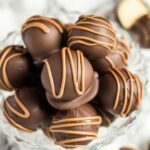 Can I freeze these truffles? Yup! They freeze well for up to 2 months. Thaw overnight in the fridge. 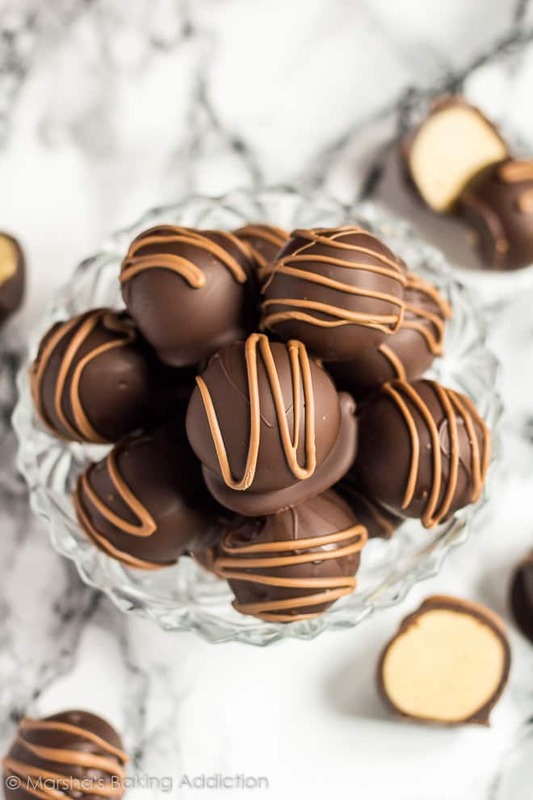 Deliciously creamy bite-sized no-bake peanut butter balls, coated with dark chocolate, and drizzled with milk chocolate! Using a handheld or stand mixer fitted with the paddle attachment, beat the butter on medium speed until creamy. Add the peanut butter, vanilla, and salt, and beat until smooth and combined. Add the icing sugar, and beat on low until combined. The mixture will be crumbly, but you should be able to roll into balls. Roll the dough mixture into 1-inch balls (about 0.5oz each), and place on a baking tray lined with parchment paper or a silicone mat. You should have about 40 - 45 balls. Refrigerate until firm - about 1 hour. Add the dark chocolate to a microwave-safe bowl, and heat in 30 second intervals, stirring after each one, until melted and smooth. Leave to cool for 5 minutes. 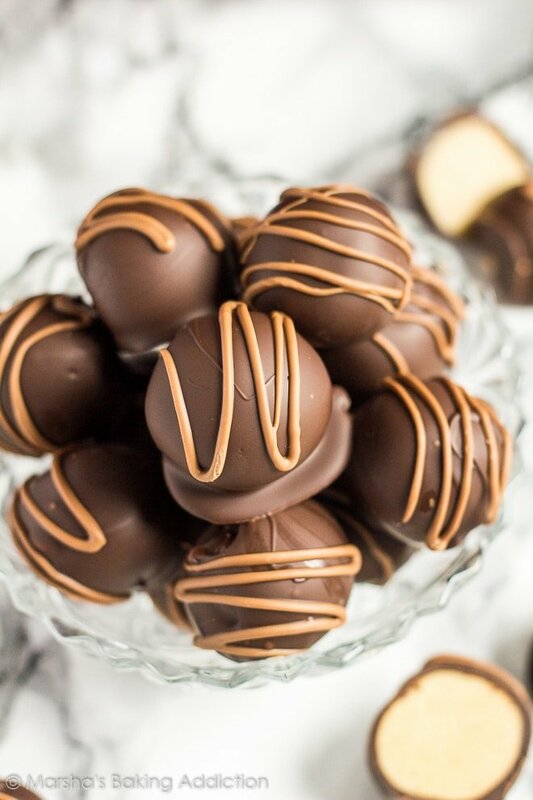 Dip each peanut butter ball into the melted dark chocolate, and place back onto the baking tray. Drizzle with the milk chocolate. Allow to set in the fridge before serving. You may use any type of chocolate you want, you don't have to use dark! Is icing sugar powdered sugar? I’m confused on that. These are really nice, but difficult to get the chocolate right! Sorry it’s probably obvious to other, but could you tell me what the sugar icing is? Does it just mean add 3 cups of 10x sugar? Thanks they look so yummy! Icing sugar is powdered sugar, or confectioners sugar. Enjoy! These were the Best!!! Thanks for sharing!! I wanna try this recipe! But, can I just use a whisk since we don’t have mixer ? It might be a bit tough to mix the ingredients by hand. Hi , what kind of peanut butter are you using ? The all natural one ? It wont form into balls for me. What can I do to fix this??? Is the mixture too crumbly? Try adding milk, 1 tablespoon at a time, until it becomes easier to roll. It’s saving grace is the flavour. Rolling is a logistical nightmare. Hi Fabio, the mixture is crumbly, but should definitely be rollable. To make it easier, try damping your hands when rolling, or you could add milk, a tablespoon at a time, until it becomes easier to handle.